Zygodactyl Blend, the Caffeinated Parrot's very first microroast blend, a full body Full City roast combining the finest Organic, Shade Grown, Fair Trade Ethiopian and Brazilian coffees, in homage to both the birthplace of coffee and the New World home of the most endangered parrots in the world including the Hyacinth macaw. We are proud to feature our Hyacinth macaw and Spokesparrot Princess Tara on our new label. And yes, Princess Tara really is a princess. Her parents are a Duke and a Duchess. 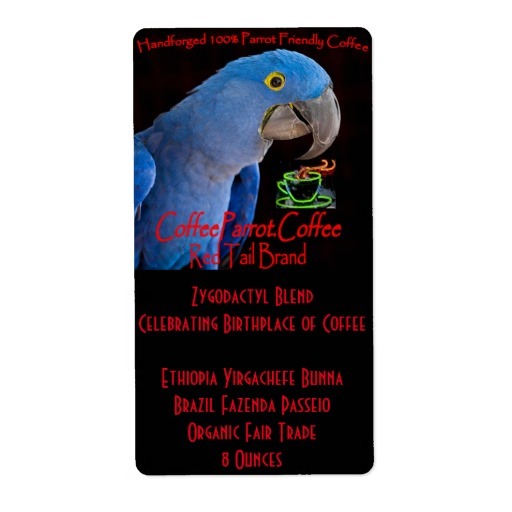 Get your Coffee Parrot Coffee Red Tail Brand Zygodactyl Blend whole bean coffee at The Caffeinated Parrot: CoffeeParrot.Coffee. You read that right. Coffee Parrot Dot Coffee.